Still having wonderful weather here, especially temperature wise. And so nice, yesterday morning as well as this morning we had a little bit of rain, just enough to resfresh a bit the garden. But most of the day it is sunny, sometimes a bit cloudy, but lovely weather. What did we do Wednesday? Well, not so much. I did some shopping, just a few things, and made a wonderful new recipe I found. Ovendish, with rice, vegetables and chicken, tasted real good. I gave a bit of own switch to it, because I didn;t have all the veggies of the recipe. I will give you the link to the website, you just have to throw Google translate on it. And do check out some of the other recipes, lots of yummie and easy things! Most of the recipes are for about 4 persons, so I took around half of the amount of ingredients, and that was more than enough for us(but we aren't very "big"eaters) I even had left for the next day. I gave french bread with herb-and garlic butter to it. Yesterday however, I worked hard! Yeah, I started to paint the kitchen.Just did one part, some little parts of the woodwork need another coat, but oh my, it looks so fresh again. So today the second coat here and there and the other half of it, then some cleaning will have to be done, and then we can put on the vinyl. Oh, my kitchen will look so nice again! Next week I want to do the cleaning of the woodwork in the hallway, and may be already in the second half of the week we can start the painting there too. So slowly we are progressing, taking off some days and then spending a few hours again painting or whatever needs to be done at that moment. It works well this way, no point in working two whole days in a row, because it;s too straining,. well, slower, taking a bit more time for it, does the trick too! As you can understand I don;t have too much time rambling along, lots to do today! I have a mini kit for you. A few more papers than in the Nutshell kits, but a bit less than in the "large"kits. 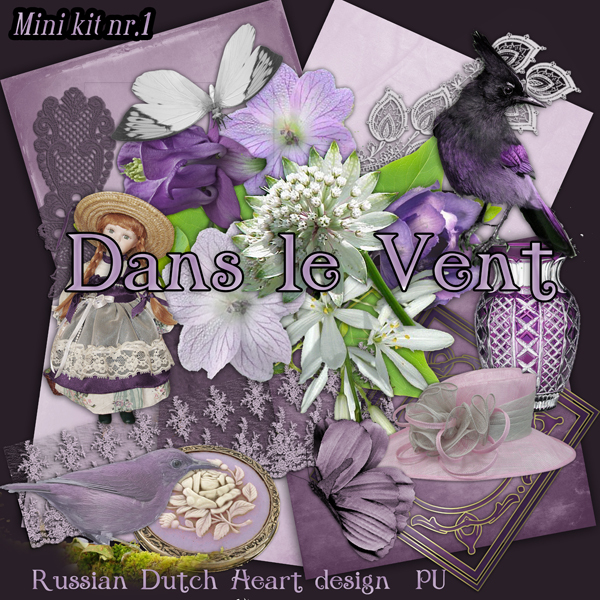 In my favourite color, purple/lilac and named it "Dans le Vent" (In the wind). Great add-on from Arlene, surely you can make a wonderful romantic layout wioth it.! What a beautiful kit! I love that dark bird. Pretty soon, the whole inside of your house will be new again. You are right to do a bit at a time. It is best for your health, and then when the work is finished you will be able to sit back and enjoy it. Now it is back to work for me. You have a beautiful day, hugs, Edna B. 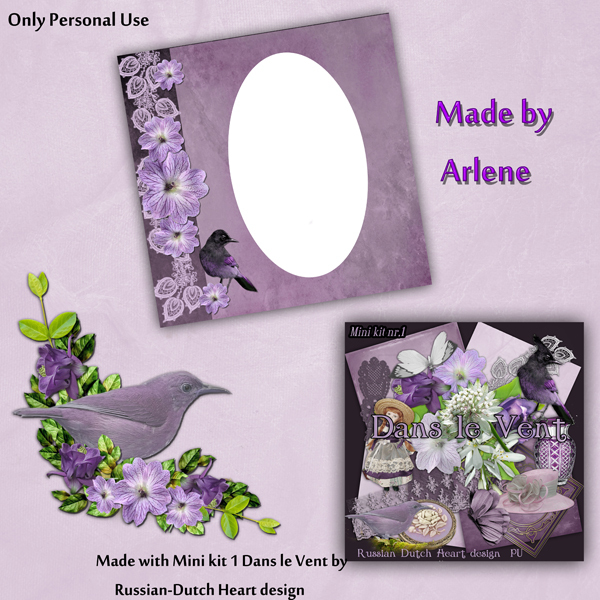 Thank you so very much for this love In the Wind kit and Arlene's is beautiful as always too. Love these colors together. I am glad you are so excited and happy about your "new and refreshed" kitchen. Doesn't it just make everything brighter and happier when we do these things to our homes? I "refreshed" my bedroom just by changing the colors of the curtains and the spread on my bed...love it! Small things make us happy huh? Well, off to do some more sorting of things for my office, getting ready to shut it down in about 6-8 weeks! Trying to get all that I don't need immediately in storage boxes for the storage unit. Chat more with you next week. Have a wonderful weekend ahead! Hello and Thank you for these lovely downloads. Kyra it's good to hear that your work is going well and that you have been spacing it out so as not to get too tired or sore. Just popping in here to say a general THANKS for ALL of your nice kits!